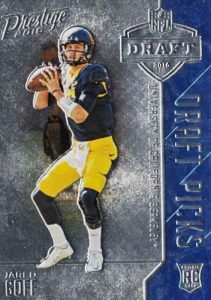 A modern staple of the card brand, 2016 Panini Prestige Football features an updated look and plenty of variety. Each pack includes a signed card for a total of four autographs per box. The 2016 Panini Prestige Football base set works with a full-bleed design for both stars and rookies. A total of 100 Rookies will include their updated draft information along with college images. 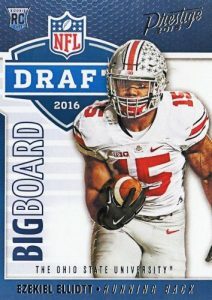 This will be the first NFL product to reflect the team that drafted the rookies in 2016. There are also ten Short Prints that average two per case. Xtra Points parallels apply subtle highlights with Red, Purple (#/100), Gold (#/50), Platinum (#/25) and Black (#/10) versions. 2016 Panini Prestige Football autographs largely utilize a sticker signature and include Rookie and Veteran Signatures on the base design. Red, Purple, Gold , Platinum and Black (#/10) parallels build on the rookie options while veterans include Black (#/5) versions. 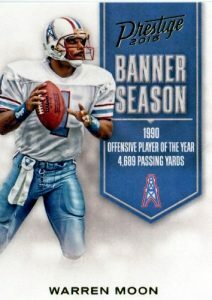 Honoring top performers, Banner Season Ink (#/50) celebrates notable stats with a banner design and signature. 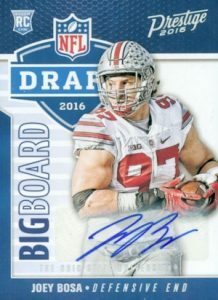 Offering hard-signed content, Draft Day Signatures contain top players from the 2016 NFL Draft with on-card autographs. There are also Red Ink and Green Ink short prints. 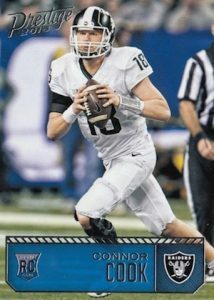 Presenting collectors with different themes and technologies, several inserts close out 2016 Panini Prestige Football. NFL Shield (1 per box) inserts showcase the league's logo and there is also a Die-Cut (#/25) parallel. 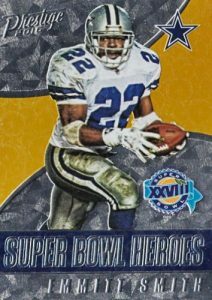 Super Bowl Heroes (1:2 packs) pay homage to previous players in the big game with a micro-etched design. 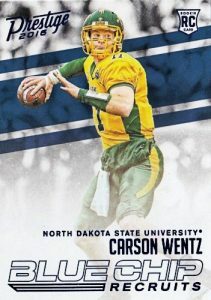 Other inserts include All-American (1 per box), Banner Season (1 per pack), Blue Chip Recruits (1 per pack), Draft Big Board (1 per pack), Draft Picks (1:2 packs), Inside the Numbers (1 per box), NFL Passport (1 per pack), and Team Logo (1 per box). 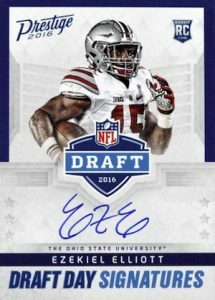 EZEKIEL ELLIOTT 2016 PANINI PRESTIGE XTRA POINTS ROOKIE AUTO 11 50! 300 cards. Ten rookie cards are Short Prints and noted as SP below. These average 2 per hobby case and 1 per retail case. Shop for Rookie Short Prints. PARALLEL CARDS: Xtra Points Blue (Retail), Xtra Points Green (Fat Packs), Xtra Points Red, Xtra Points Gold #/50, Xtra Points Purple #/100, Xtra Points Platinum #/25, Xtra Points Black #/10. PARALLEL CARDS: Xtra Points Red, Xtra Points Purple #/100, Xtra Points Gold #/50, Xtra Points Platinum #/25, Xtra Points Black #/10. Card #80 not found in checklist. All subjects not included in parallels. View specific options with full spreadsheet. PARALLEL CARDS: Xtra Points Purple #100 or less, Xtra Points Gold #50 or less, Xtra Points Platinum #10 or #/3 (Card #100 #/7), Xtra Points Black #5 or 1/1. **Card #29 only found in parallels. All subjects not included in parallels. View specific options with the full spreadsheet. 25 cards. Serial Numbered #/85. Retail Only. 25 cards. Serial Numbered #/50. Retail Only. 39 cards. Blue ink cards have an announced print run of 75 or less. PARALLEL CARDS: Red Ink - 25 copies or as noted*, Green Ink - 5 copies or as noted*. *Red Ink: Joey Bosa PR=22, Leonte Carroo PR=6, Wendall Smallwood PR=30. *Green Ink: Cody Kessler PR=4,Joey Bosa PR=10, Leonte Carroo PR=4. 25 cards. Serial Numbered #/25. Retail Only. PARALLEL CARDS: Die-Cut #/25 or less. 50 cards. Serial Numbered #/100. Retail Only. 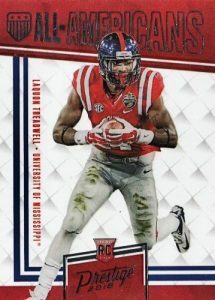 Will their be any NFL jersey rookie cards short prints this year? When is the checklist due? 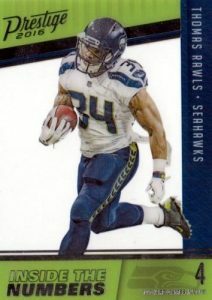 Webb � Panini has no real consistency with their checklist releases. It has lately been the day before or day of release. kevin mitro � Yes. In fact, a good portion of the inserts and several parallels are only found in retail packs. CC lists the release date as July 8. I believe its live, no? Jamey F. � It’s live. Just a typing error. First box opened– NO AUTOGRAPHS!! Bad Luck?? or Bad Product?? Any print run on the Draft Day Signatures? Of the 4 auto’s I rec. only Corey Coleman is a name I’ve heard of, the other 3 were very late Rd drafted players or not drafted at all. The coleman was a Purple #’d /100, only #’d card I received. Very SAD ! Nothing GOLD or BLACK or GREEN, Only ONE “OK” hit, Very SAD ! I’ve seen some eBay listings for a Jumbo retail box containing 12 packs of 40 cards. Do the retail packs contain an auto? 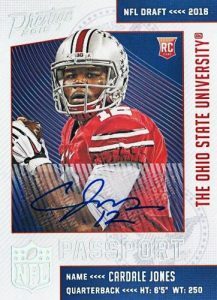 Does anyone know when the print run for the draft day signatures will be released? Mostly an underwhelming product except for the various rookies not wearing their NFL team uniforms. The multitude of various inserts diminishes the attraction of product. I pulled a Jared Goff #201 out of 2016 Prestige but the cards pic is of Cowboys LB Jaylon Dmith, is this a one off misprint? The back is completely the Goff #201 and the front has Goff’s name but with Jaylon’s card front from Classics #292? FYI, I GAVE THIS a 4 star cause I also pulled some nice autos.